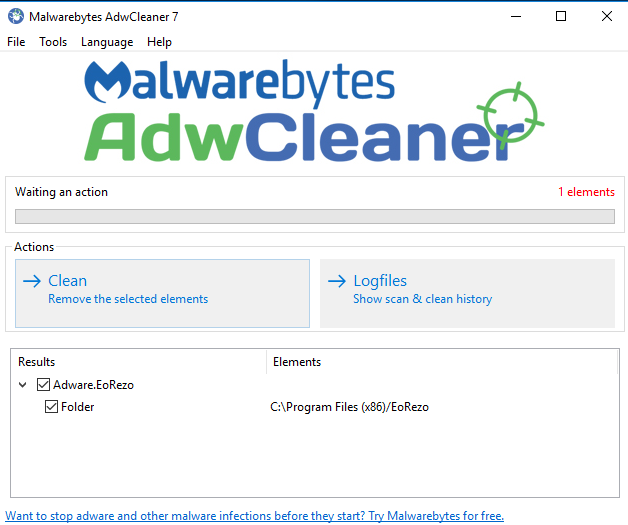 AdwCleaner is a tool that searches for and deletes Adware, Toolbars, PUP (Potentially Unwanted Programs), Hijackers, and more. It works with a Search and a Deletion Mode. The latest version 7.1 does not work, nice job malwarebytes! Working Perfectly now, I use Malwarebytes premium latest Beta 3.0.4 so that may help? First class but make sure flagged issues are genuine as it can flag genuine programs/files as suspicious, but still a great product for cleaning up an infected PC ! Last 3 versions have been crashing my Win 10 X64 on the clean, this was always great, now has a problem for me, not sure why they have updated last 3 days or so but not good for me right now unfortunately! picks up what others might miss, very fast scan non bloat . great tool. i highly recommend using this in safe mode though in order to make sure everything it finds is successfully removed. however it will work fine running it on the desktop in "normal" boot up mode as well as it has never failed to remove anything on my end. Bottom Line: The latest version 7.1 does not work, nice job malwarebytes! Tool for removing tons of app-crap from many computers. If you infected by PUP - you must use AdwCleaner. But, don't forget - use it in a safe mode. an absolute must have in the malware tool box. I have a similar tale to relate from a couple weeks ago, Straspey, except I (unfortunately) did the cleaning. I threw everything at it, including AdwCleaner. It worked well. Within days, they got it reinfected. I'm not helping them again, except to tell them to run AdwCleaner. Last week, a family member called in a panic because he went to some snarky website and the next thing he knew his computer was awash in hijacked browsers, popups and all sorts of stuff. I told him to download this program, run it, and say "yes" to everything it wanted to clean. He did it -- and his system was returned to its previous happy state. Then guess what he did ? He went right back to the very same website and got re-infected AGAIN -- the exact same way! So he went back and ran AdwCleaner another time, and it saved him this time as well. Fool me twice, I'm an a s s h o l e."